Quantum computers may one day solve problems that are effectively beyond the capacity of conventional supercomputers. Quantum communications may enable instantaneous, secure transmission of information across vast distances, and quantum sensors may provide previously unheard of sensitivities.A global race is on to develop these new quantum information technologies, in which information will be stored in quantum bits, or qubits. In conventional digital technologies, a bit is either 0 or 1, whereas a qubit can represent both states at the same time because of a strange phenomenon of quantum physics called superposition. In theory, this will enable a massive increase in computing speed and capacity for certain types of calculations. 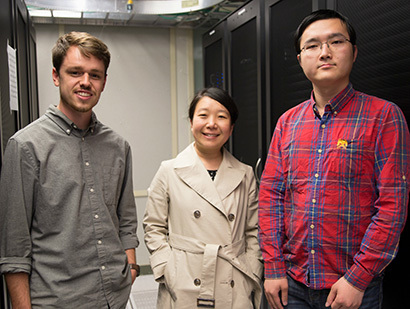 At UC Santa Cruz, materials scientists are working to develop novel materials that can serve as the foundation for quantum information technology, just as silicon chips paved the way for today’s digital technologies. Several different systems for creating and manipulating qubits have been proposed and implemented, but for now they remain too cumbersome for real-world applications. “Our focus as materials scientists is on what material we should use as the fundamental element to carry the information. Other researchers are more concerned with how to wire it up to make a device that can perform calculations, but we’re focused on the material basis of the qubit,” said Yuan Ping, assistant professor of chemistry and biochemistry at UC Santa Cruz. In particular, Ping and other UCSC researchers are focusing on defects in extremely thin materials, called two-dimensional (2D) materials. Defects or imperfections in the atomic structure of a material can function as qubits because information can be encoded in the spin states of their electrons. This phenomenon has been well studied in other types of materials, most notably the “nitrogen vacancy” or NV defect in diamond. But according to Ping, 2D materials offer significant advantages.